Get ready to defeat villains alongside the coolest alien-powered kid hero when Ben 10: Omni-Tricked arrives on DVD September 18, 2018. Fans can revisit the adventures from Cartoon Network’s hit animated series with 16 action-packed episodes and a 44-minute special. Following Ben and his family as they go on a cross-country road trip, fans will embark on a fun, extraterrestrial animated journey. 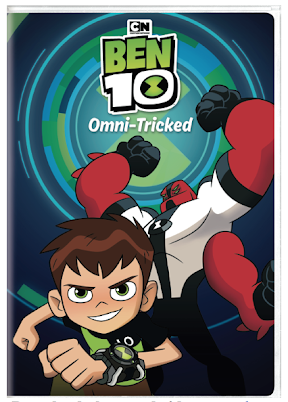 The season one, volume two release, Ben 10: Omni-Tricked, will retail for $14.97. Cartoon Network is Turner’s global entertainment brand and the #1 animation network in the U.S., offering the best in original content for kids and families with such hits as, Adventure Time, The Powerpuff Girls, Steven Universe, We Bare Bears and The Amazing World of Gumball. Seen in 192 countries and over 400 million homes, Cartoon Network is known for being a leader in innovation with its approach to engaging and inspiring kids at the intersection of creativity and technology. Its pro-social initiative, Stop Bullying: Speak Up is an acknowledged and often used resource for kids and adults looking for tools that can assist in dealing with the ongoing issue of bullying.